This bold recipe is not for the faint of heart. 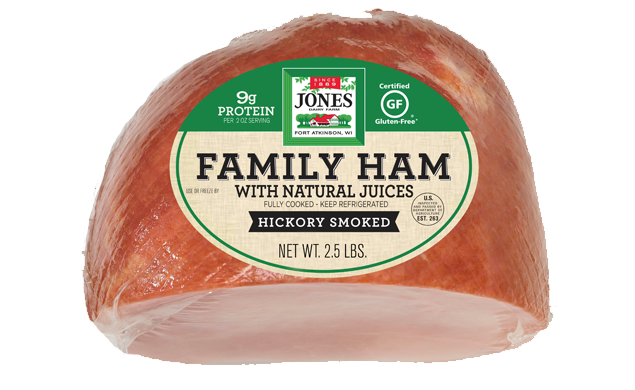 Spicy pepper jelly is mixed with apple juice and sweet jam and basted onto a smoky Jones Dairy Farm ham. If desired, score fat layer on ham. Place ham in baking pan that has been sprayed with cooking spray. In small microwave-safe bowl, combine hot pepper jelly and jam; mix well. Microwave on HIGH for 15 seconds. Remove from microwave and stir. Set aside 1/4 of glaze to serve along with the ham. Pour apple juice over ham then baste with 1/4 of glaze. Cover with foil and place in preheated oven. Bake for 20 minutes then baste with another 1/4 of glaze. Bake another 20 minutes then remove foil and baste with remaining 1/4 of glaze and pan juices. Cook for 15 minutes then baste ham with pan juices and cook an additional 10-15 minutes, or until internal temperature reaches 145°F. While ham is resting, reheat remaining hot pepper jelly glaze. 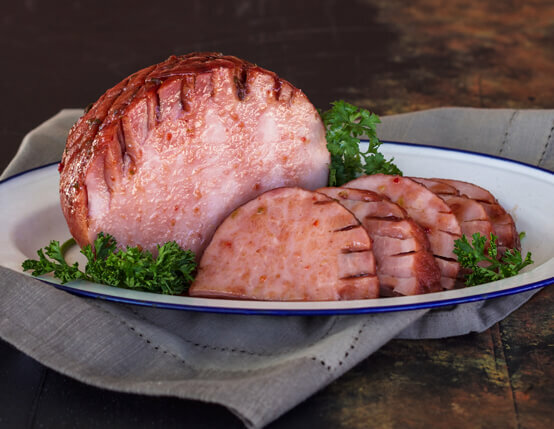 Serve ham with hot pepper jelly glaze.